A few months ago, we covered the best apps to inspire you to get healthy. The apps we covered were designed to motivate you, push you, and give you new tips for working out. However, one of the biggest challenges as a full-time worker, side hustler, and/or entrepreneur is often finding time to do everything. If you’ve ever wondered how you’re going to get all your work, errands, and side gigs completed in 24 hours (and occasionally sleep…), you’re the perfect candidate for time management apps. Trello is the online version of what a cork board or whiteboard used to be for many people. Trello allows you to create “cards” of things you have to do – kitchen remodel, planning a wedding, business contacts to follow up on, etc. Open up one of your cards to create a checklist of things to do, add attachments, and due dates. You can also invite people to your Trello cards, if you have virtual assistants or freelance writers on your team. Assign them due dates and start discussions about upcoming work tasks. Trello also syncs with Dropbox, Google Drive, and OneDrive so you can link to attachments anywhere. Asana is similar to Trello, except it’s even more project management oriented. While you can use Asana as an individual, I’ve seen it used successfully as part of a team. If you work with freelancers or virtual assistants around the world, Asana makes it easy to assign tasks, make notes on upcoming tasks, create due dates, and see all of your team’s projects in one central location. Asana also offers a dashboard, so you can track project completion throughout the month. Asana will send you emails updating you on the status of your projects, so you can monitor your team’s progress from where ever you are, with little to no input from you. If you want to move to a four hour workweek, Asana will help you get there! I personally love to do lists. Many people believe them to be overwhelming, because you could make your to do list very long, but I get satisfaction from checking off daily tasks, no matter how small. Any.do helps my obsession with to do lists by creating a simple interface where you can assign tasks (to yourself or others), set due dates, add reminders for yourself, and create lists for later. Take Any.do with you everywhere, too, as it syncs across iOS, Android, via a Chrome extension, and through a Mac app. Wunderlist is similar to Any.do, in that it’s a beautiful to do list that syncs across multiple platforms to keep you updated throughout the day. With Wunderlist, you can group related tasks into folders and share those tasks with your team or your family, depending on the list. You can also use tags in Wunderlist to group similar notes you want to reference later, which is especially helpful if you’ve made a note to yourself about blog or business ideas you want to revisit when you have more time. With Wunderlist, you can email yourself notes to follow up on later, and you can print out your to do list if you want a hard copy. Many people nowadays use Dropbox, and it only continues to get better. Dropbox is cloud based storage that saves your files to folders, to be accessed any time, any where you get internet. Dropbox is a great app for entrepreneurs and side hustlers, as you can access your files and share them with your team from anywhere. Even if you don’t use Dropbox to save files, including Word, Excel, and PDF documents, you can use Dropbox for personal storage, like family photos or personal documents you want to save in an alternate location. Dropbox shouldn’t be the only place you save important files, but it’s a handy back up to your computer. An Evernote Basic account, which is free, is the perfect app for creatives and freelancers everywhere. With Evernote, you can clip images or articles from around the web, tag and save them for later, then search for them later to use. Evernote makes taking notes from around the web easy, and it’s searching feature is incredible. If you’re anything like me, and occasionally save items in the wrong place, Evernote makes it easy to find what you’re looking for without any hassle. Evernote also offers collaboration with your team, so if your virtual assistant finds something interesting for research you’re doing, they can add it on Evernote and share with you for later. I personally love Evernote because it is more visual than Asana or Trello, which is great when you work with infographics and social media images, like Pinterest. LastPass is for everyone who’s ever forgotten a password and been really angry about the whole clicking “lost your password?” and had to waste precious minutes to create a new password, which they would inevitably forget 10 minutes later. Basically, LastPass is for anyone. As someone who studied cybersecurity, I was initially very hesitant about LastPass. In fact, if you talk to some cybersecurity experts, they still won’t recommend you use any password-saving apps, instead encouraging you to remember your long, cryptic passwords. Others have realized people, no matter how focused they are, will never remember all of their passwords and have to turn to something better than writing it down. Enter: LastPass. LastPass is a very secure password-keeping website and app that stores your login info for numerous websites. LastPass can even store your credit card information, which is encrypted, just like the passwords, for you to use on sites where you shop frequently. Personally, I don’t use LastPass to store my credit card info (I figure I’m not too lazy to get up and get my card when I online shop), but having LastPass log me into places like Facebook, Twitter, and my to do/project management apps is very handy. If you have multiple Gmail accounts, LastPass can get confused, but it’s best to change your password on any business or sensitive sites anyway, so it hasn’t been a problem. Pocket is very similar to Evernote, in that you can save items around the web, tag them, and read them later. Unlike Evernote, Pocket is not quite as visual, but it’s perfect for the entrepreneur/side hustler who wants to stay updated on their own time. You can save articles to read around the web, including on Twitter, FlipBoard, and from your browser if your on a site you want to reference later. I use Pocket to save interesting articles I want to reference in later freelance articles, and tag them to find later. If you don’t have time to read everything at that moment, save it on Pocket for later and read at your leisure! 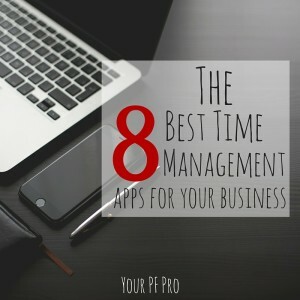 The best things about these time management apps are that they can help you find pockets of free time, determine where your time can best be spent, and possibly help you delegate tasks to a virtual assistant. If you’re trying to maximize your time and profits, check out these apps to make yourself immediately more productive. What are your favorite time and/or project management apps?